Secretary of State Mike Pompeo is flying to North Korea for his fourth round of meetings with nuclear negotiators, as the Trump administration insists it is not backing down from its demand for that nation's "complete, verifiable, and irreversible denuclearization". America's top diplomat will touch down in North Korea for the latest round of diplomatic talks roughly one year after North Korea launched its first intercontinental ballistic missile. There are fresh doubts about whether North Korea will follow through on the commitment it made at President Trump and Kim's Singapore summit after newly released satellite images show North Korea expanded a key missile-manufacturing plant and reports emerged that U.S. intelligence has concluded the regime is working to conceal the extent of its nuclear weapons program. But there is also concern that the Trump administration is softening its stance on North Korea and new questions about its ability to achieve those demands. President Trump has praised his historic meeting with Kim and said progress "is going well!" 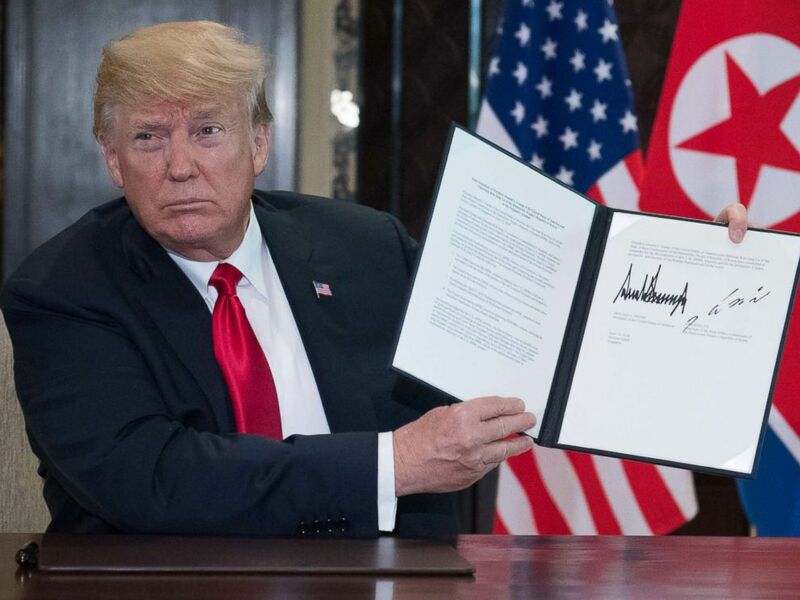 With no public progress or new steps from the North Koreans, however, that claim seemed dubious to many analysts, who questioned whether the administration is taking the summit itself as a success and pulling back on its other demands. "Nothing could be further from the truth," State Department spokesperson Heather Nauert said in a statement. "Our policy toward North Korea has not changed, we’re committed to a denuclearized North Korea." 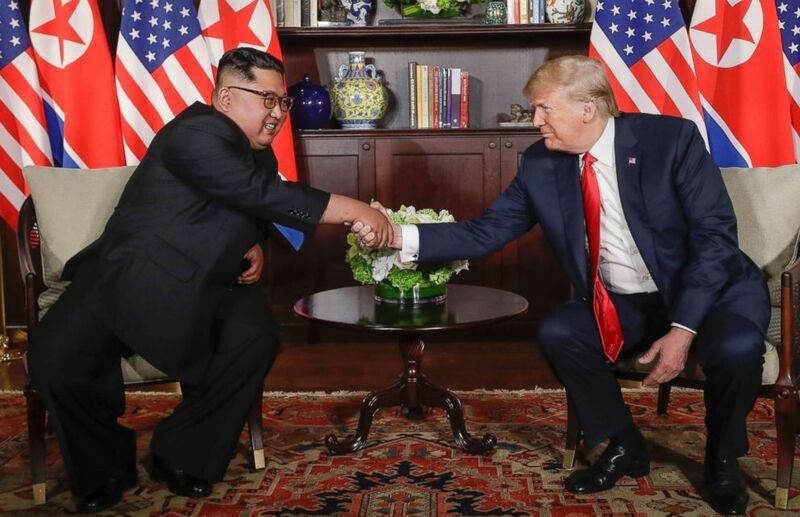 President Donald Trump shakes hands with North Korea leader Kim Jong Un during their first meetings, June 12, 2018 in Singapore. Secretary Pompeo followed that up with a tweet, saying he was "looking forward to continuing our work toward the final, fully verified denuclearization of #DPRK, as agreed to by Chairman Kim." That phrase itself – "final, fully verified denuclearization" – is a change in language and possibly a new marker for what the U.S. hopes to eventually achieve. Nauert has also used it in recent days. Pompeo in the past has dismissed questions about "verifiable" and "irreversible" as both insulting and trivial semantics: "The 'complete' encompasses verifiable in the minds of everyone concerned. One can't completely denuclearize without validating, authenticating – you pick the word," he told ABC News the day after the Singapore summit. Whether "everyone concerned" is on the same page now seems to be an open question, and part of Pompeo's trip will be about making sure North Korea maintains its commitment. But to move forward with the commitments made, Pompeo and his team will also need to begin to build out the framework of what denuclearization looks like, how it can be achieved, and what the U.S. will begin to do to keep up its half of the agreement – providing security assurances for the regime. 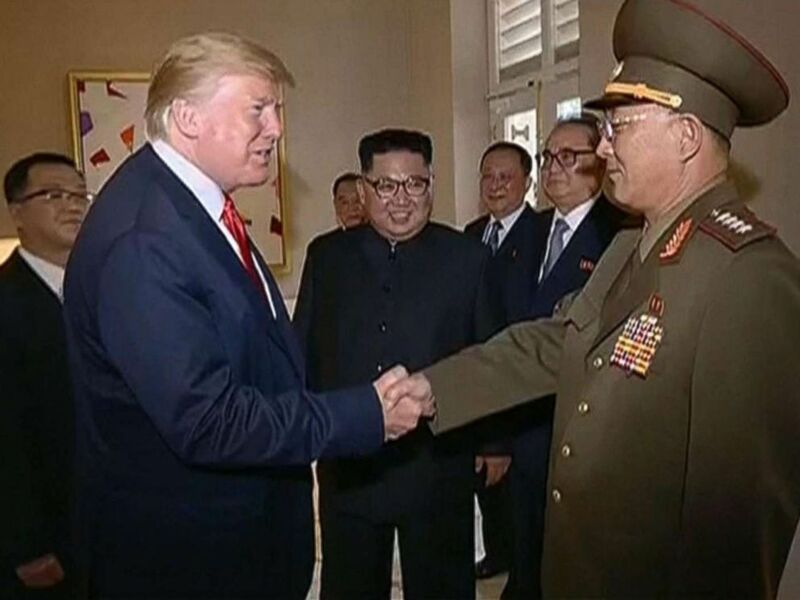 Video shown by North Korean state television shows President Donald Trump shaking hands with a North Korean general while North Korean leader Kim Jong Un looks on during a summit in Singapore, June 12, 2018. A State Department official tried to lower expectations for the outcome, telling ABC News it is a new round of talks and not to expect a blueprint out of the meetings. Joining Pompeo for the meetings are Nauert, Deputy Assistant Secretary for East Asian and Pacific Affairs Alex Wong, and U.S. Ambassador to the Philippines Sung Kim, who led the delegation that negotiated the joint declaration Trump and Kim signed and that met again Sunday in the Demilitarized Zone between the Korea's. Pompeo will also have CIA Korea Mission Chief Andy Kim, his right-hand man for this issue who first traveled with him to Pyongyang when Pompeo was CIA Director.